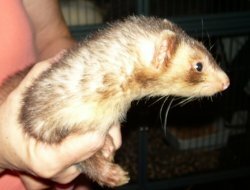 While our primary goal is to rescue ferrets, there always seems to be other animals in need from time to time. We found these little kittys on a country road near death. 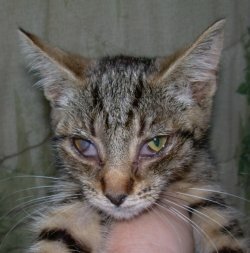 Eyes glued shut from conjunctivitis, upper respiratory problems, fur on bones and loaded with fleas and ear mites. 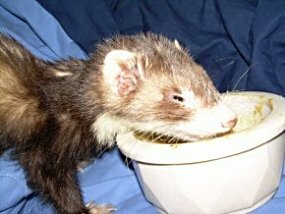 Knowing that they faced euthanasia if turned in to the local humane society, we took them in, quarantined them from the ferrets, and made sure they got the treatments they needed. Two of these kids are only 4-5 weeks old, the larger one is about 9-12 weeks old. 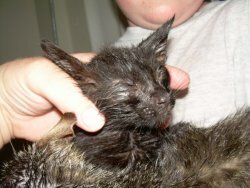 Even as we treated their eyes (which has to be painful and awkward) they laid purring in our arms, knowing that we were trying to help them. These pics were taken the second day we had them as my camera was misbehaving the day we picked them up. Hey! Look at us now! This is the tail of Gizmo the 3rd with the biggest cordoma I have ever seen. 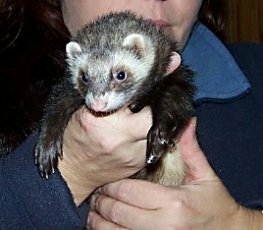 He is one of 11 ferrets we took in as a result of a multi animal seizure. 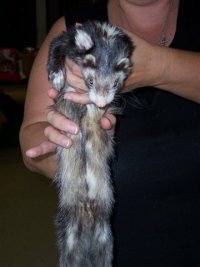 Funding has been donated to have the mass removed. I've had to wrap it it in a large band aid patch as it drags the floor and is subject to abrasions. Poor baby. 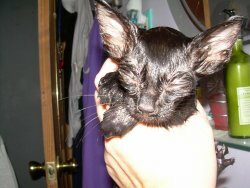 And this is Gizmo's pretty face. Only a few more days until he doesn't have that mass dragging on his tail. 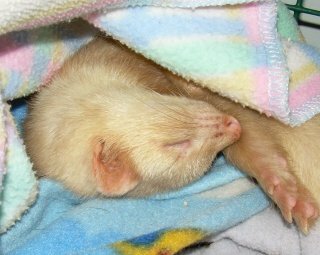 Back at the rescue the 11 snuffled through blankets like they had never felt anything so comfortable...and they hadn't in at least 2 years that we know of. This is Sugar. She has a swelling in her cheek that needs to be diagnosed. At least three of the group are also adrenal. It was several days before they began playing. It seemed like they didn't even know how to play. We will be breaking them up in groups of two and threes for adoptions but so far it's very hard to tell who is most bonded with who as they are usually all laying together! 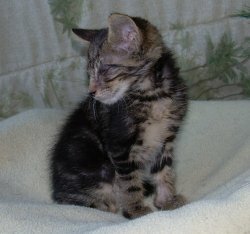 When I picked up this little guy at the Humane Society he was being held for 10 days for "biting". As I held him for the first time I thought he was an old frail little man...then I noticed his pearly whites. 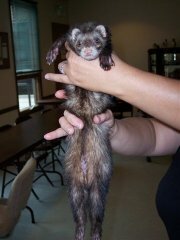 He wasn't an old man at all but very sadly an emaciated young ferret under 7 mos. old. He must have stressed at being dropped off and no one noticed that he wasn't eating. "Wolfy" reminds me so much of Winston when he came in. Literally fur on bones. In one of these pictures you can see where my fingers rest under his fur as they touch his bone with not an ounce of muscle mass. 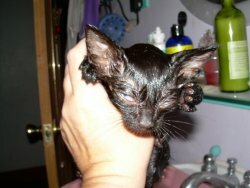 I was shocked that he weighed in at even a pound. 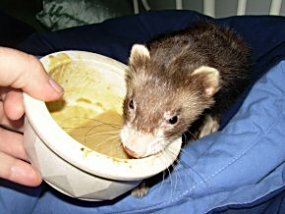 Fortunately, he ate without hesitation, his little eyes squinting in joy at the taste of the yummy gravy. He put on 6 ounces two days later. Three days after he came in, he did a little wardance and he is always at my feet waiting for his next plate of chicken gravy. As far as being a biter,....well, maybe if he had been fed, he wouldn't have been going for fingers? I don't know...I do know this guy is not even capable of nipping. 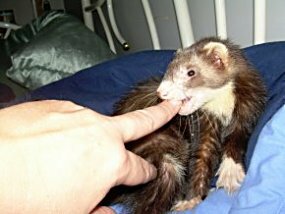 When the gravy was licked clean from my finger, he ever so gently took my finger into his mouth looking for more gravy. 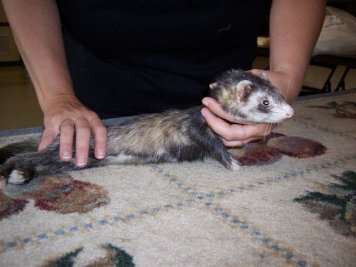 He is gentle and loving and eats up being loved on. 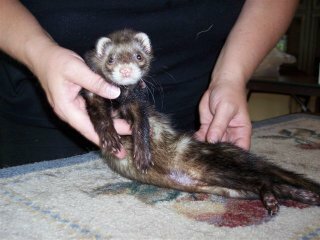 Wolfy will be able to go to a home by mid August providing he has gained enough weight. What a pretty boy!!! 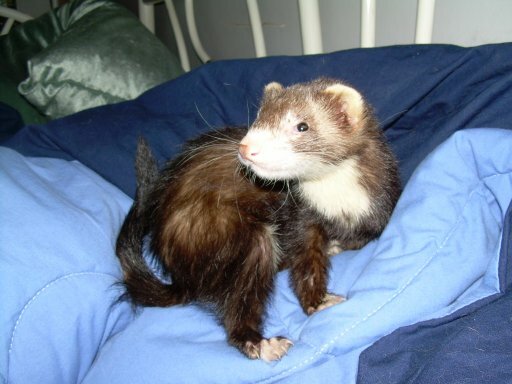 Winston and Duncan came to us after their "human" left them in a cage, completely unattended to for at least two weeks. No food. No water. No play time.......no love. Where there was supposed to be a stomach, little Winston had nothing. They responded quickly to having the things in life that we as self sufficient beings take for granted . Within days I could feel the weight they were putting on as they responded to food, water.....and smooth jazz playing in their room. 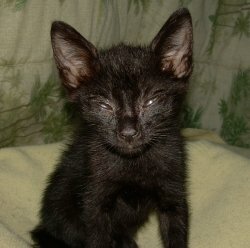 Pics coming soon of Winston and Duncan-post recovery from neglect and in a new Home! This is Franke. Dropped off at the rescue at only 6-8 weeks old in a guinea pig cage,given only the basics. No attention, no love and obviously no time out to play. 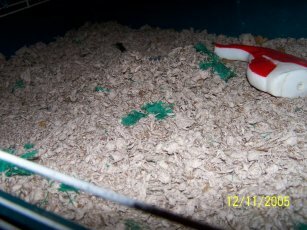 The green particles among the pine chips are pieces of his only bedding, a thin nylon hammock that he shredded to bits out of frustration. Another clear case of "Not knowing what you're getting into" when purchasing an animal companion at a pet store.